KREATIVEN is a an elegant, simple, and visually stunning creative theme. KREATIVEN can be used as either a ‘one-page’ template, or as multi-page. It is perfect for either teams, or a single creative freelancer. With an abundance of custom homepage templates you can choose the perfect fit. Looking fantastic on retina devices, with beautiful typography, gorgeous iconography, subtle CSS3 effects, and those small details that really make you stand out from the crowd. 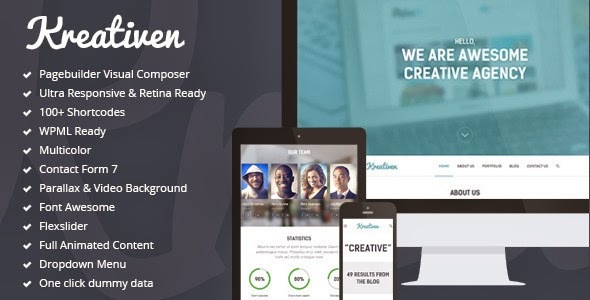 Item Reviewed: Kreativen - Responsive Creative WordPress Theme 9 out of 10 based on 10 ratings. 9 user reviews.